R▲ is an underground cyberpunk artist, based in Moscow working in ‘laser alchemy’ and ‘info glitch’. Challenge: Visual artist R▲ wanted to create interactive projection-mapped audiovisual art using a wearable projection device. Solution: R▲ designed the VIDEOBLΛST_R, a wearable device that projects animated graphics via an ultra mobile Optoma PK-320 projector. Results: VIDEOBLΛST_R’s visuals look like hieroglyphics and include looping geometric shapes. The projections work well on walls and other exterior surfaces and objects. Visual artist R▲ wanted to create interactive projection-mapped audiovisual art using a wearable projection device. R▲ designed the VIDEOBLΛST_R, a wearable projection device that allows users to project audiovisual pieces in any outdoor conditions. It comprises eight vector graphic pieces animated via Processing. Each animated piece can be triggered by pressing buttons on a Nintendo Wii Nunchuk controller. Each visual features sonic accompaniment by sounds from a Cweiman S1 modular synthesizer. 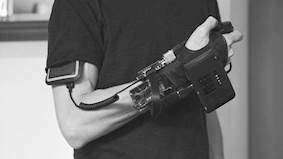 The hardware is fixed to the forearm in true cyberpunk fashion - on a rollerblade armguard and powered by a DC battery, housed in an iPhone armband. The wearable is then wired to an Arduino Uno microcontroller board, while button mappings are processed via Arduino Nunchuk library. The visuals are transferred through USB Serial to a Raspberry Pi 2 single-board computer, with audio and video output via HDMI into an ultra mobile Optoma PK-320 projector. 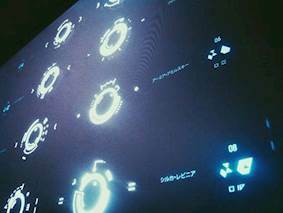 VIDEOBLΛST_R’s visuals look like hieroglyphics and include looping geometric shapes. The projections work well on walls and other exterior surfaces and objects. He wants other artists to use VIDEOBLΛST_R as inspiration for more forward-thinking wearable, projection-mapping video-graffiti units. The PK-320 is no longer in production but Optoma’s ultra mobile LED ML750e projector has been used for similar projects such as the Walkabout Projection from PRICKIMAGE artist, Shaun O’Connor. 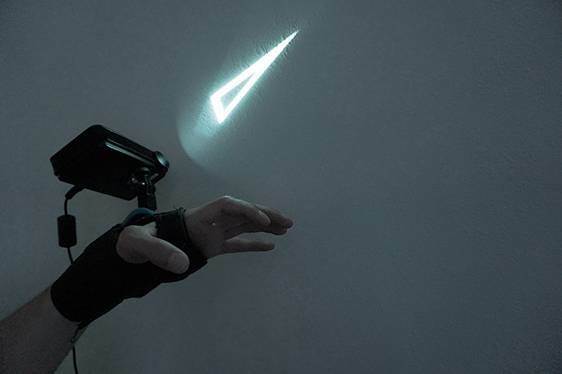 His bespoke 3D characters are manipulated and controlled using hand gesture technology and projected from this tiny hand-held projector. Weighing just 380g, the diminutive ML750e HD Ready projector with 700 LED brightness and WXGA resolution, incorporates a media player, native office viewer, built-in speaker and HDMI connectivity. LED projectors use less energy than traditional lamp-based models and the perceived brightness from LED projectors can be twice that of an equivalent lamp-based model. Shaun said: “The ML750e had best ratio of size, weight, lumens and power consumption for our needs. As the unit needs to be powered by battery – it was essential we have the most energy efficient solution. The battery and equipment for the Walkabout projection was installed in a purpose-designed harness that is worn under clothing – so invisible to the public.